Honda has released a teaser image of the 2015 Honda CR-V, letting us know that we’ll be able to learn everything about the car on the last day of September—and it will be for sale on the 1st of October! We can’t wait to put you behind the wheel of the 2015 model, but for now all we can tell you about it is that it looks like the grille is a bit narrower and there are a few other design elements that have been changed. 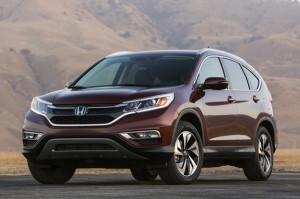 Though it’s on the way out, the 2014 Honda CR-V is still worth a final look. With three trim levels—LX, EX, and EX-L—and your choice of two- or four-wheel drive on every trim level, the CR-V makes it easy to get just what you want out of it. Offering seating for up to five, it makes an excellent family vehicle, and the EPA-estimated 31 mpg highway fuel economy* of the 2014 CR-V LX 2WD makes it easy to slide into the family budget. One of the most impressive parts about the CR-V, though, is its array of standard features. You’ll find Bluetooth HandsFreeLink, a touchscreen infotainment system, a rearview camera, and so much more on the entry-level LX trim, no need to upgrade. To see how other crossovers compare, take a look at our side-by-side comparison of the CR-V and competing crossovers. While we’re leaving the 2014 Honda CR-V and its successes behind, Honda looks like they’ve got something exciting in store for us on the 2015 model. Visit a Central Illinois Honda Dealer near you and ask to take the CR-V for a test drive. If you see us after October 1st, you’ll be one of the first drivers to see the CR-V firsthand.